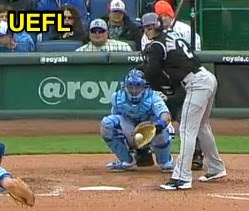 HP Umpire Dan Bellino ejected Rockies SS Troy Tulowitzki for arguing a strike three call in the top of the 4th inning of the Rockies-Royals game. With one out and none on, Tulowitzki took a 3-2 fastball from Royals pitcher Jason Vargas for a called third strike. Replays indicate the pitch was located over the inner edge of home plate and knee high (px -.931, pz 1.840 / sz_bot 1.700), the call was correct. At the time of the ejection, the Royals were leading, 3-0. The Royals were leading, 3-2. This is Dan Bellino (2)'s first ejection of the 2014 MLB Regular Season. Dan Bellino now has 9 points in the UEFL Standings (5 Previous + 2 MLB + 2 Correct = 9). Crew Chief Jeff Kellogg now has 7 points in the UEFL's Crew Division (6 Prev + 1 Y = 7). This is the 43rd ejection of the 2014 MLB Regular Season. This is the 15th player ejection of 2014. Prior to ejection, Tulowitzki was 0-1 in the contest. This is the Rockies' 1st ejection of 2014, T-3rd in the NL West (LAD, SF 2; COL, SD 1; ARI 0). This is Troy Tulowitzki's 1st ejection since Aug 1, 2013 (Marvin Hudson; QOC = N [Balls/Strikes]). This is Dan Bellino's first ejection since Aug 9, 2013 (Ron Roenicke; QOC = Y [Fan Interference]).